The DSX copper cable certification solution is part of the new Versiv™ certification product family; which also includes CertiFiberPRO and OptiFiberPRO fibre modules. 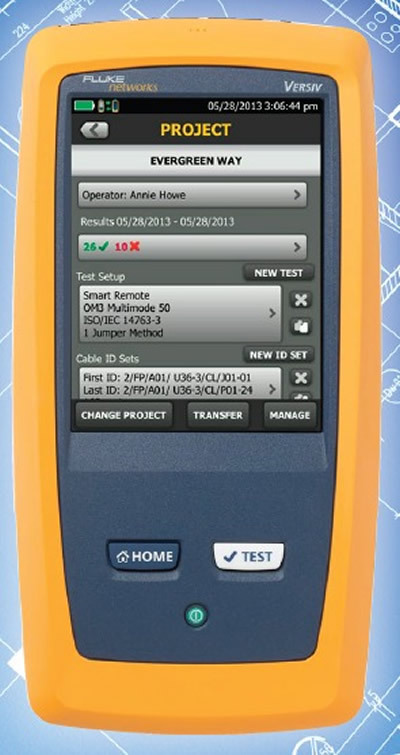 The DSX-600, at just over £6k +VAT, is designed for those who only want copper testing up to Cat 6A. The DSX 5000 offers compliance to the latest and future standards, that’s Level V accuracy requirements for Cat 6, Cat 6A or Class FA. 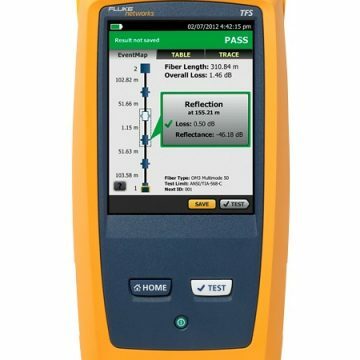 Plus increased test times; completing a full Cat 6A or Class FA standards test in just 10 seconds and only three seconds to certify two fibres at two wavelengths in both directions using the fibre module. Whereas the DSX-8000 certifies up to 40 Gigabit Ethernet and Class 8! The revolutionary ProjX™ management system – this wizard steps the user through creation of projects with ease, helping to reduce any margin for error, plus makes it simple to switch between projects, track progress and collate results. Taptive™ user interface – the high quality touch screen display offers simplified diagrams and animated instructions to help all levels of user. 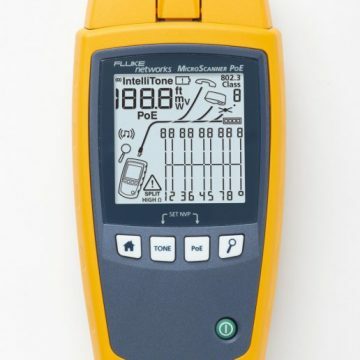 To arrange a discussion with one of our engineers about any of the DSX or Versiv family call us now on 01677 428700 or email info@fullcontrolnetworks.co.uk alternatively you can see it on Fluke Networks website. 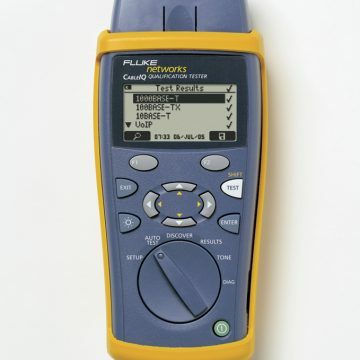 Why not request your copy of the “Copper Testing Best Practices Pocket Guide” from Fluke Networks. Whether you handle copper infrastructure on a regular basis or just occasionally, this pocket guide will serve as a useful tool to ensure you never miss a critical step during your copper testing or troubleshooting. The DSX-5000 CableAnalyzer enables cable testing and certification for 10 Gigabit Ethernet deployments – whether it is an existing Cat 5e, Cat 6, Cat 6A or Class FA cabling system, the DSX tests to all industry standards. 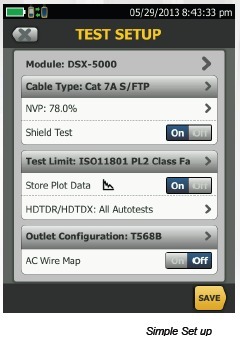 Whereas the new DSX-8000 enables testing up to 40Gig and Cat 8! The DSX exceeds the IEC Level V specification with less than half the allowable crosstalk margin, assuring you of higher confidence in results over the full frequency range. Additionally complex Alien Crosstalk link-to-link certification is simplified by integrating the measurement capability into each copper module for 10GBASE-T testing. The DSX is the first field tester to support balance measurements including Transverse Conversion Loss (TCL) and Equal Level Transverse Conversion Transfer Loss (ELTCTL). The new ProjX management system on the DSX provides individual project files for all job specific details to be saved under a simple name. This minimizes set-up errors or lost files when switching from one job to another or utilizing multiple testers on a single job. In addition, it provides test results by cable ID, merges any changes without duplicates and always defaults to the last copper or fiber module installed. ProjX management system provides real time status to completion on each job with a 0-100% scale and gives the operator the option to isolate any test requiring a second look and helps to assure nothing is overlooked. The “Fix Later” selection creates a punch list or automatic to do list for correcting any workmanship. 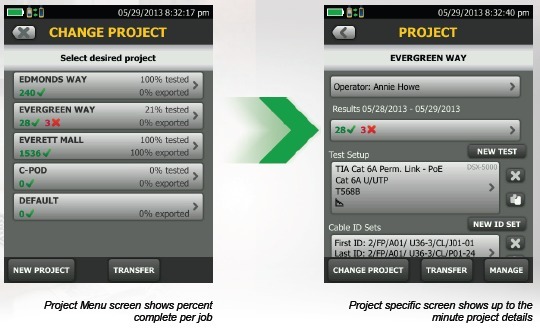 ProjX enables project managers and crew leaders to be truly efficient. Taptive user interface is easy enough for even the newest technician to perform tests across multiple media types and testing requirements. The capacitive Taptive user interface makes all jobs easily accessible from the menu screen. Touch the job you’re working on and the large display confirms the test that needs to be performed, animated instructions simplify setting the tester configuration making correct testing assured. No tester offers so much speed for so many tests. Complete copper certification to Cat 6A in 10 seconds or certify two fibers at two wavelengths in both directions in just 3 seconds. Endorsed by cabling vendors worldwide assures that Versiv is the fastest way to project completion and system acceptance. Quickly get a Pass or Fail result and easily review individual test parameters by value or drill into specific area on a graph. The DSX reduces the time required to fix cabling faults with Dedicated Diagnostics, a simple 1 button test runs all tests and saves all data. The graphical results screen allows you to look down the cable to see exactly where any cross talk, return loss or shield faults are happening on any given link. Previous testers had frequency limits of their diagnostic capabilities of up to 250 MHz only, but the DSX CableAnalyzer has no limitation. The DSX CableAnalyzer is the first field tester to report distance to shield integrity issues using a patented A.C. measurement technique. This is especially important in datacenters. Other testers will show the shield connected even when it isn’t, because the racks in a datacenter are common grounded. Other testers may tell you there is a break in a shield, but not pinpoint the exact location giving no indication of where to start rework. Leveraging the popular and multi-featured LinkWare management software application, DSX CableAnalyzer users can easily access the ProjX management system data, generate reports, and upgrade the software in their testers. Project Managers have full capabilities to manage workflow and consolidate test results. Users can provide the finishing touch by adding their company logo to the report and offer it unaltered to their customers for system acceptance purposes. Now with LinkWare stats, the new automated statistical report option, you can move above and beyond the page-per-link report and see your entire cabling infrastructure. It analyzes and transforms LinkWare test results data into charts and diagrams that reveal your cabling plant performance; this report summarizes your entire cabling infrastructure in a compact, graphical format that makes it easy to verify margins and to spot anomalies.